I love December but with December always comes the cold, scarves and coats which I also love but the scarves always end up tangling my hair. This year I discovered the treatment from Revlon which has been literally my rescue. This leave-in treatment is applied after you wash and condition your hair. All you need to do is to spray your hair and then brush through leaving you with untangled and gorgeous hair. It can be used on both wet and dry hair. 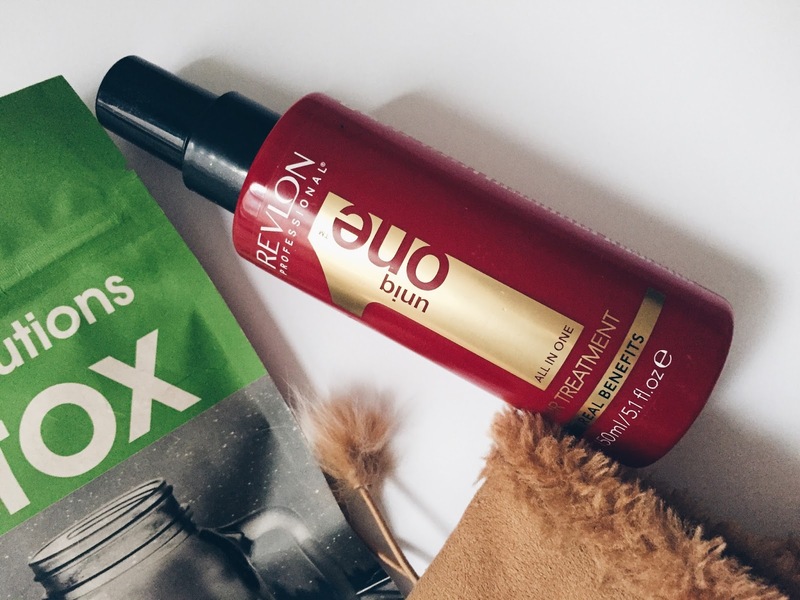 I usually use it on wet hair to nourish, condition and untangle my hair, but you can use it on dry hair as a styling product. It is available also in the lotus flower and coconut versions but the classic one is definitely my favourite! Available from Amazon, £7.99. This is my current favourite drugstore mascara! It works wonders, thickening and lengthening your eyelashes. It has a silicone wand which separates the lashes, creating a stunning false lash effect. The mascara looks best when applied in layers, the first separates and captures the smallest lashes and volumises the longer ones, the second will result in a irresistible multiplied lash look. Available in Boots, £7.99. I got this for free with a copy of Marie Claire and I absolutely love this pastel nail polish. Nail polish usually doesn’t last long on my nails but this one lasts for 4-5 days which is pretty good! The colour is a light, pastel purple which is ideal in the winter months. An absolute must-have. I cannot find it anywhere but the closest one is probably Primrose-Hill Lane Gel Effect, available from Boots, £15. Before New Year’s Eve we always experience the panic attack and sudden motivation to lose weight and look gorgeous during the party. Most of the time, half way through the month we give up, as weightloss during such short period of time is impossible without help, but now I found a helping agent so you can lose weight in just 28 days. 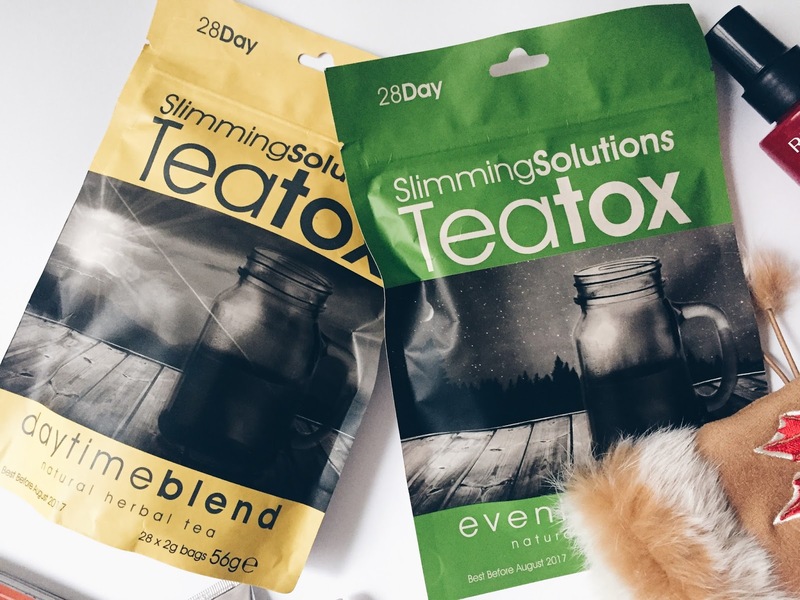 Teatox from Slimming Solutions is an effective tea detox which consists of both daytime and evening blend. The daytime blend is to be enjoyed in the morning after waking up. The daytime blend is a mix of Chinese Oolong tea, Siberian Ginseng, Fennel, Lemongrass, Nettle leaves, Ginger root, Dandelion leaf, Ginseng root and Salvia militorrhiza. The evening blend should be enjoyed every other evening before bed, and at least 30 minutes before the last meal of the day. The evening blend is a mix of Senna leaves, Hawthorn leaves, Lotus leaves, Fenugreek seeds, Burdock root, Peppermint, Psyllium seeds, Valerian root and Liquorice root. The teatox has cleansing effect, helps constipation and bloating and increases energy levels. I really enjoyed this 28 day pack. Both teas taste great, and over the time I felt better, healthier and I felt that my skin improved as well. The Teatox also increased my metabolism, improved my digestion and made me feel much healthier. Available from Slimming Solutions, £34.99. This is my winter deodorant. It offers maximum protection, using its new oxygen odour control technology. It really reduces sweating, odour and helps to stay fresh throughout the day. It is also very hydrating as it contains Aloe Vera and Vitamin E so you can always use it, even if you just shaved your underarms. It is a creamy deodorant and so it does leave marks on dark clothes, however, that is why I use it in winter months as you always wear long sleeves! Available from Boots, £3.20. During the winter months my hands always get very dry because of the weather extremes. 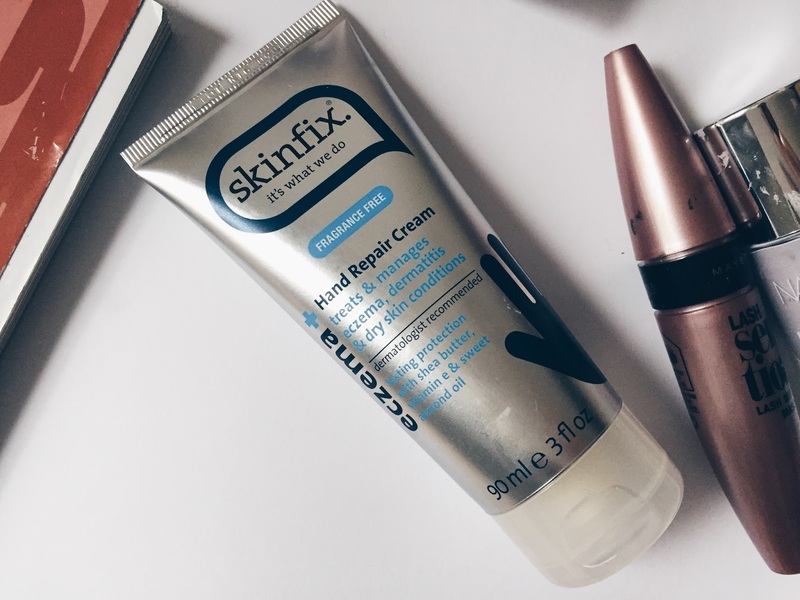 Sometimes I experience extremely dry hands and to be honest with you till this day I haven’t found a great hand cream, until I tried this Skinfix. The cream is very thick, fragrance free and very hydrating. Whenever I have dry skin patches I just apply this and after 2-3 applications they tend to disappear. It contains sweet almond oil, Shea butter and vitamin E which are very nutritious and help to create a barrier to protect the skin from the irritants and helps to lock in the moisture. If you suffer from dry hands, this is a cream to try. Available in Boots, £12.99. 3. Get ready for new challenges! I hope you are all having a wonderful Christmas and you had some downtime to relax and unwind! 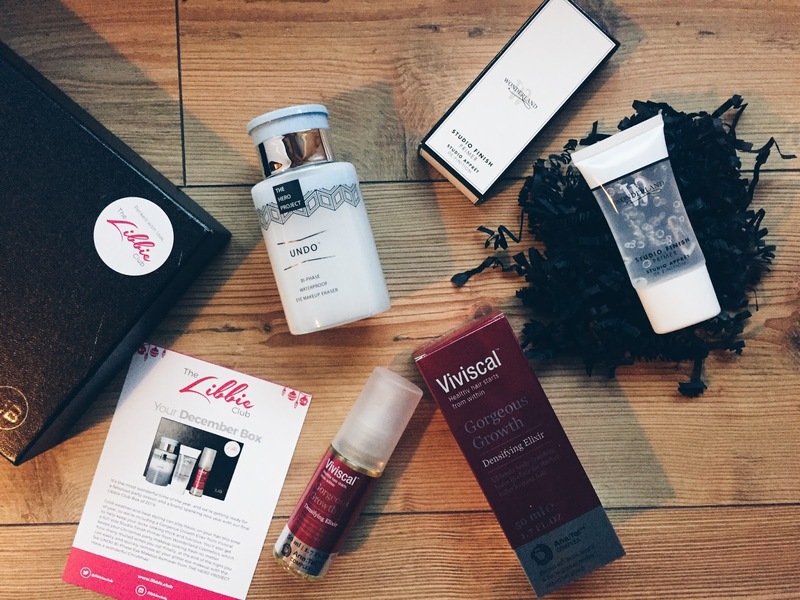 The December Libbie Club box is filled with goodies that will help you recover after this super busy Christmas period, with all the shopping, cooking and family events! All the products are available on my libbie club page here . Enjoy! During the festive period we always need to look stunning, with beautiful makeup and gorgeous hair. I love to put on multiple layers of mascara to achieve the false lash effect, but obviously this is also much more difficult to remove. We all know that rubbing a cotton pad on your eye is not the best way to remove makeup, so the best thing to do is to buy a waterproof eye makeup remover and then place the soaked cotton pad on the eye to melt away all the makeup. This makeup remover from the Hero Project is a dual-action micellar and oil formula which effectively removes the makeup without the need to continuously rub. Although it is oil based, it does not make your skin oil. What I love about this remover is that it comes with a pump so that you use just the right amount, and avoid product wastage. A makeup junkie must have! I hate to reapply my makeup during Christmas parties or New Year Eve as I am usually to busy having fun! This primer is super light and it will even out your skin, and ensure that your makeup stays flawless throughout your evening. Take a pea sized amount and apply evenly on your skin. It evens our your skin, reduces the appearance of pores as well as fine lines and maintains perfect makeup all night. 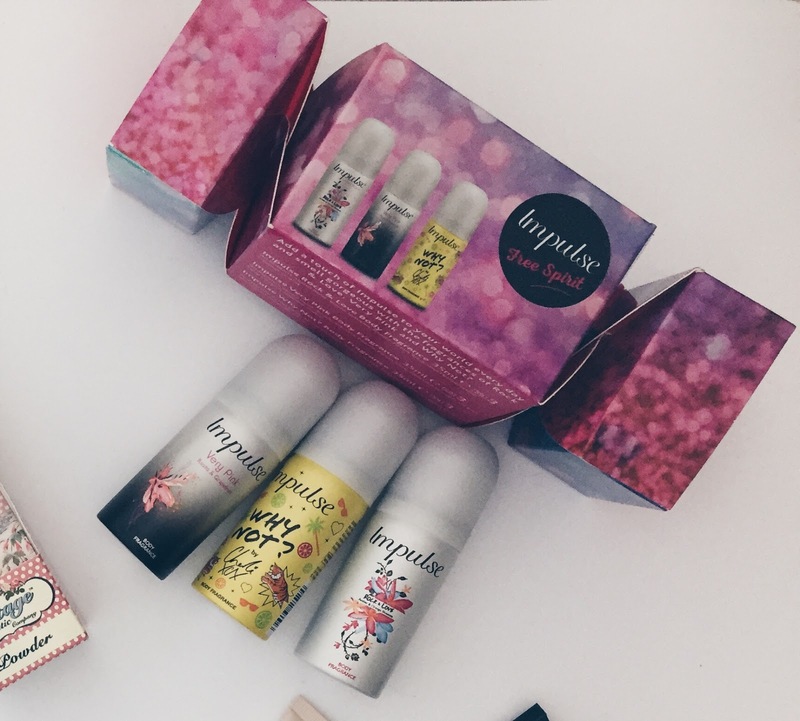 If you like long lasting makeup, it is a perfect addition to your makeup bag. With all the heat styling, hair drying and straightening the hair is weakened and more prone to breaking. 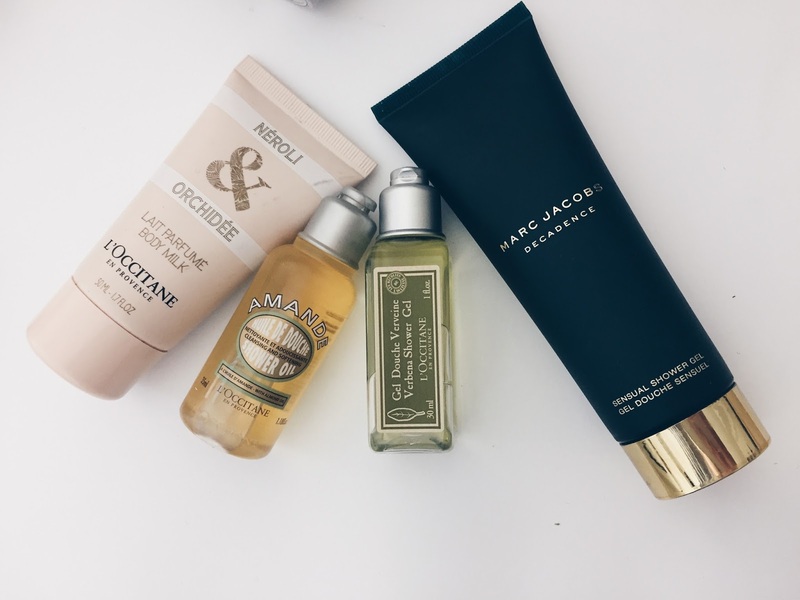 As you all know I am a fan of hair oils, and leave in treatments as I use them daily. This densifying elixir from Viviscal is there to revive your hair. It boosts hair volume, hydrates the hair and provides the nutrients needed for growth and shine. This is definitely worth purchasing, especially if you have thin or damaged hair. SPECIAL OFFER: 25% off, £14.99 instead of £19.99. 3. Think of New Year’s Resolutions! We have only one week until Christmas so I hope you have already started planning your Christmas outfit! I always leave it until the last minute and then struggle to choose a makeup that would go well with it… This time I wanted to create a short tutorial for a beautiful Christmas makeup which you can all do at home using products from jane iredale. An absolute makeup must – concealer! Apply concealer around the eyes and on the eyelids to brighten the eye area. Available here, £25. Apply the eyeshadow on top of the eye lid. This is a creamy eyeshadow which means that it is more long lasting and won’t leave the shadow dust on your cheeks. You can layer the eyeshadow for a more dramatic effect. In order to brighten the eye area, apply it also under the bottom lash and in the corner of your eye. Available from here, £22. 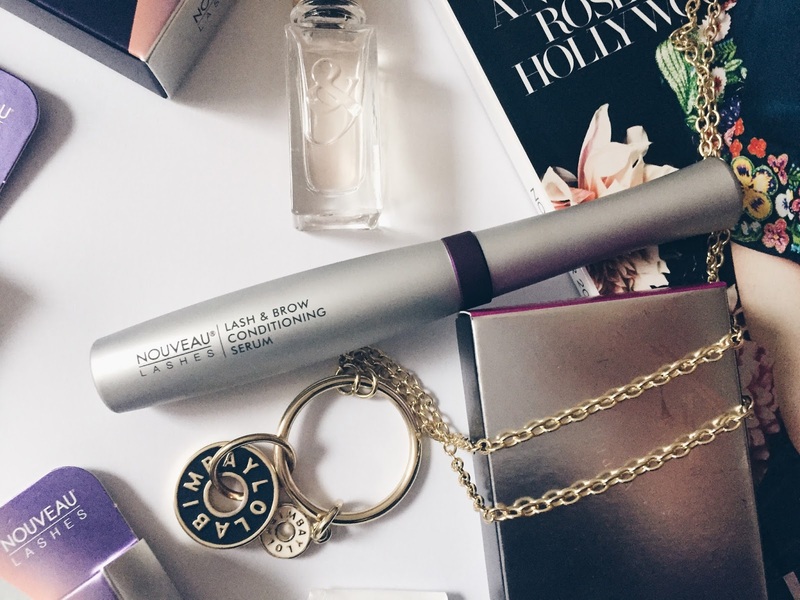 This mascara is great as you can either go for a natural or a dramatic look. It lengthens as well as thickens your eyelashes, as you can see from my photos! The lashes look so divine and thick, that I was asked if I am wearing strip lashes. I definitely recommend layering it to achieve such an amazing effect. Available from here, £26. I love to apply lip liner on the entire area of the lips as it is just more long-lasting and during Christmas dinners you are usually too busy to constantly reapply your lipstick. Draw around the contour of the lips and then fill it evenly to achieve this gorgeous matte look. Available from here, £13. 2. Try different looks before Christmas! I hope everything is going well and you are starting to think about Christmas Shopping already! I cannot wait until Christmas, I am already starting to listen to Christmas songs, lighting up candles and spraying my room with the Winter spray from The White Company. This year, I decided to start my Christmas Shopping early, and I decided to publish my stocking filler post now so that you can avoid the last minute Christmas Shopping Fever. This post features some fragrance, skincare, bodycare and accessories so you can literally find something for everyone! Need to get something for a girl who has literally everything? Brushes are always a good idea as they need to be replaced every now and then. I know what you might be thinking… Toothbrush, is she crazy? This toothbrush is a great gift for every single person. The WooBamboo toothbrush is made from organically grown bamboo which is sustainable and also panda friendly! Every person uses up multiple toothbrushes in a year which unfortunately results in unnecessary pollution, so switching to the bamboo toothbrushes will be beneficial for the entire planet. 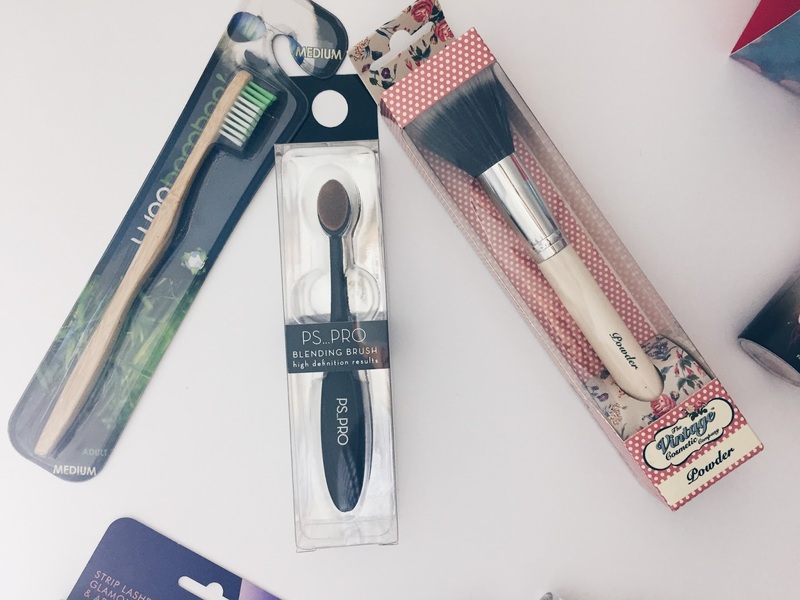 Another advantage of these toothbrushes is that they have a super cool design and can be customised so you can paint someone’s name or write a message which makes this gift even more unique. Love this! Available from Amazon, £8.31. I recently saw these brushes in Primark and I couldn’t resist the bargain price! This one only costs £2.50 which is not even comparable to the other high street brands. This brush has a plastic handle and artificial bristle but still does the job and is great for blending. 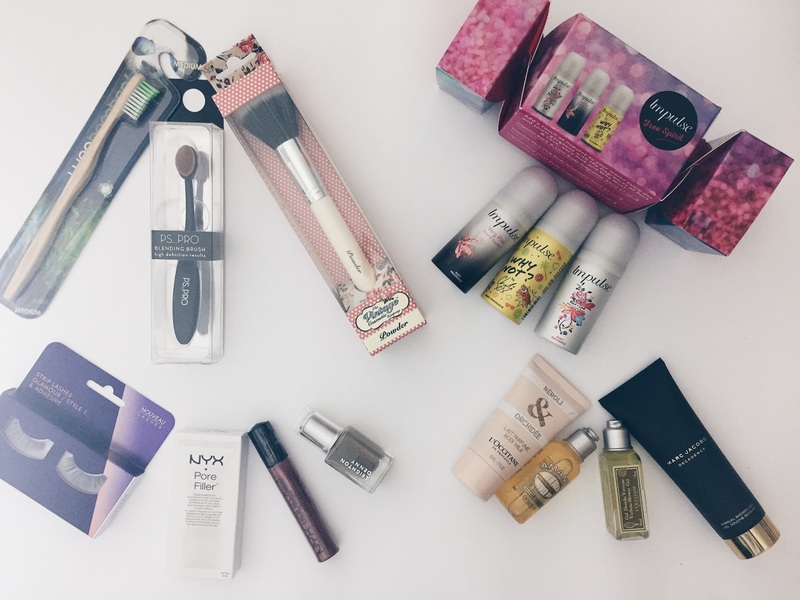 A perfect gift for a makeup junkie! I think almost every person I know uses powder foundation, so this is quite a universal gift, you just can’t go wrong with. The brushes from The Vintage Company are ideal for stocking fillers as they are nicely packaged in a retro styled box. The brushes are made with artificial bristle, and a plastic handle. I am a fan of the design as it really reminds me of the 60s so this gift would be great for a girl who loves the retro and vintage feel! I found lots of these mini Shower Gels at home as I am a loyal L’Occitane fan so I often get these with purchase. I think these are ideal for stocking fillers as they smell nice, are good for the skin and the packaging is pretty. You can often purchase these in a set, so head over to your L’Occitane store and get browsing! This is my favourite range from L’Occiatne. I mentioned it already a few times on this blog. It smells absolutely divine and I think that this travel size is just so convenient! Smells divine, looks divine, can replace perfume on a relaxed day. Great gift for a jet setter, a person who loves to lounge or just any girl! The Decadence fragrance from Marc Jacobs is very unique and it is definitely not for everyone. You will either love it or hate it, so it is quite a tricky gift. I would recommend it for a person who loves heavy fragrances and who often mixes different scents together. It is the most expensive stocking filler but if you want to buy something from high end, this is ideal. I got this with a fragrance purchase but a full size costs £34 for 150 ml in Boots. Strip lashes are a great stocking filler as they are not pricey but look stunning. My current favourites are from Nouveau Lashes Glamour Style 1. They have a dramatic effect and make your lashes long, thick and glamorous. Available for £4.95 from Nouveau Lashes Website. 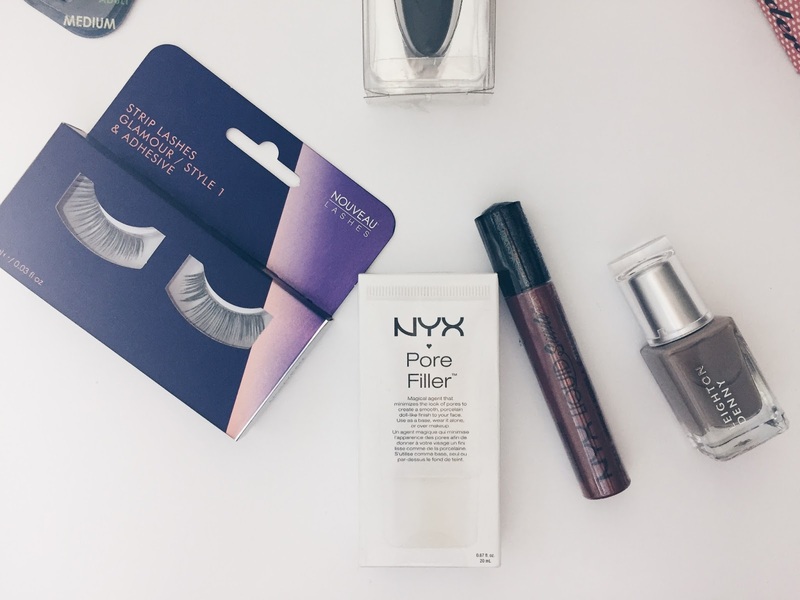 Get the perfect looking makeup with the NYX pore filler! It works as a perfect foundation base, reducing the appearance of pores, leaving you with a flawless makeup. If you want the porcelain doll-like finish, this would be a perfect gift for yourself! Available at Selfridges, £11. I think that nail polishes and lipsticks are from the same category – You can never have too many! The Suade Cream Lipstick leaves that desirable, matte finish. It is velvety soft and waterproof, so ideal for the rainy London weather. Available in a variety of shades Selfridges, £6.50. You can never have too many nail polishes. I am currently into neutral colours so I would recommend the Brief Encounter by Leighton Denny. They are a bit more pricey than the usual polishes you can get in Boots but they are beautifully designed and the shades are stunning! Available from Lookfantastic, £12. I love love love christmas crackers, especially if they contain beauty products inside! The Crackers by Impulse is a must buy! Not only is it a cute, gift, it is also very useful. Each fragrance is different, the fragrances included are Ver Pink, Why Not and Rock and Love. Each fragrances is 35ml so can be carried in a handbag as well as is super convenient for travel. Available at Superdrug, for £4. 2. Listen to Xmas Songs! I don’t know if you heard but there is an amazing virtual makeup app from the beauty guru, Lisa Eldridge which you need to download right this minute! If you are a beauty lover, and have 1000 looks you would like to try, you can now do it within seconds using the Makeup Plus App! Lisa Eldridge is one of the best beauty gurus, there is no doubt about it. I have always been her fan, and a loyal subscriber. On her YouTube channel, Lisa talks about makeup, skincare and haircare, often showing great makeup tutorials, skincare regimes or even long haul flight routines. After achieving such success, Lisa has been invited to join Lancome, and is currently their Global Creative Director. As I said before in the intro, Makeup Plus is an app that you can download for free from the app store on your iPhone, Android or iPad. In order to try a look, all you need to do is take a selfie (which we take all the time anyways! ), and choose the look you want to try. The app accurately ‘applies’ all the products on your face giving you the perfect makeover without you using any actual products. The app is user friendly and easy to use! You can tell that the best technology was used when creating this app as the facial recognition is perfect, meaning that it applies the products like a a makeup artist would. There are many different looks you can try, and Makeup Plus saved me a lot of time when getting ready to go out as you can take a picture in your outfit and try the looks, then proceed with the actual makeup application. You can either try the ready makeup filters or you can create a look from scratch, choosing your foundation, lipstick, eyeshadows, eyebrows shape, eyeliner, mascara etc. You can also change your hair colour which is the feature I absolutely loved as you can see on my makeup pictures! The app allows you to easily save your photos to the camera roll. You can also share your pictures with friends and fans easily as the app is liked with social media accounts. I would definitely recommend it to anyone, as it is great fun and allows you to experiment with some stunning looks! Download the FREE MakeupPlus beauty app and try out the Lisa look! For a full tutorial on how to use the app head over to Lisa’s YouTube Channel. Remember to share your looks with me! 1. You need this app! As you saw on my Instagram, I received a stunning Halloween surprise from IIAA just before halloween. 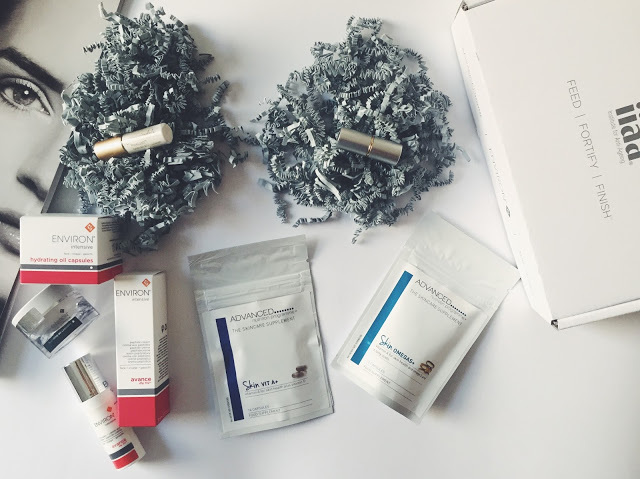 The package included a set of amazing products for skincare, haircare, and makeup from Environ, Advanced Nutrition Programme and jane iredale. IIAA (International Institute for Anti-Agein) provides products to both professionals and beauty therapists and focuses on a philosophy Feed Fortify and Finish. Feed the skin using the Advanced Nutrition Programme Supplements, Fortify the skin with skincare products from Environ and achieve a perfect Finish with the pure mineral make-up by jane iredale. 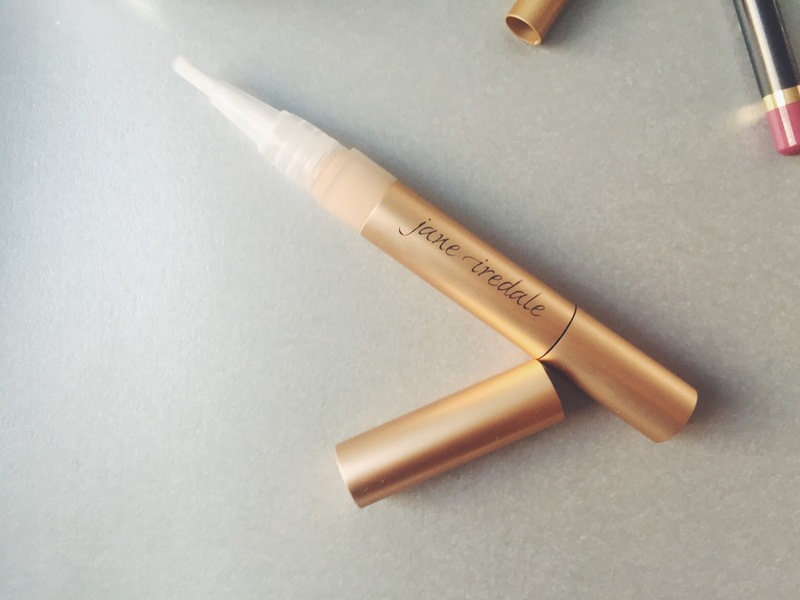 This is a multipurpose product from jane iredale. You can use it as a both Lip and Cheek stain, saving time as well as space in your makeup bag! It is a very fascinating product as it will look different on every person, and the colour that develops depends on your mood or skin temperature. It reacts with the skin, creating a vibrant lip or cheek colours. 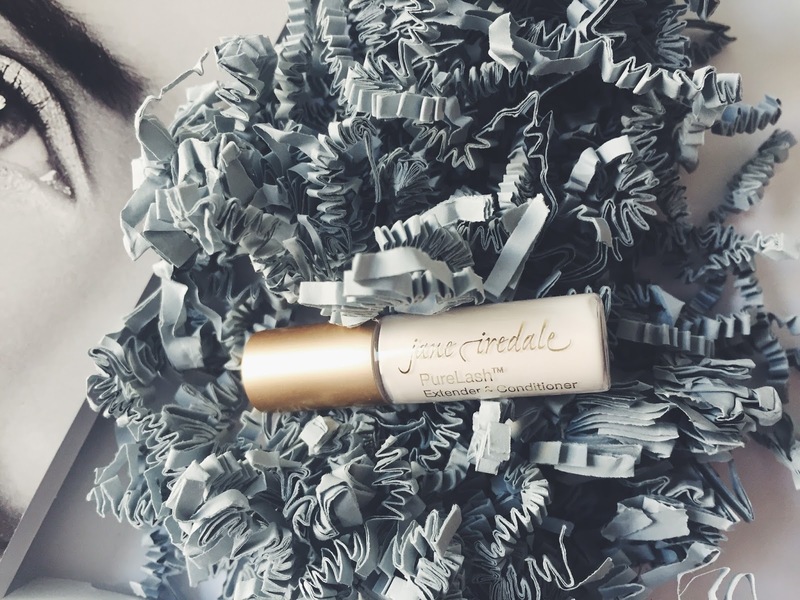 jane iredale’s makeup is mineral, and has great skin benefits. It contains rose flower wax, beeswax, avocado butter and olive butter which make it nourishing and hydrating, ensuring that your lips not only look good but also feel good. The product has a delicate pomegranate flavour, which also acts like an antioxidant. I liked using it on my lips as it kept them hydrated, and added a vibrant colour. You can use it either alone, over a lip pencil or under a lipgloss. Available from IIAA Website, £22 for a full size. If you have been using too many strip lashes, too many layers of mascara or you feel that your eyelashes need some loving, you should try this PureLash Extender Conditioner. It contains ingredients such as algae extracts which helps to condition and protects lashes, reduces splitting and breaking and enhances growth; panthenol which conditions the lashes; wheat protein which straightens the lashes. 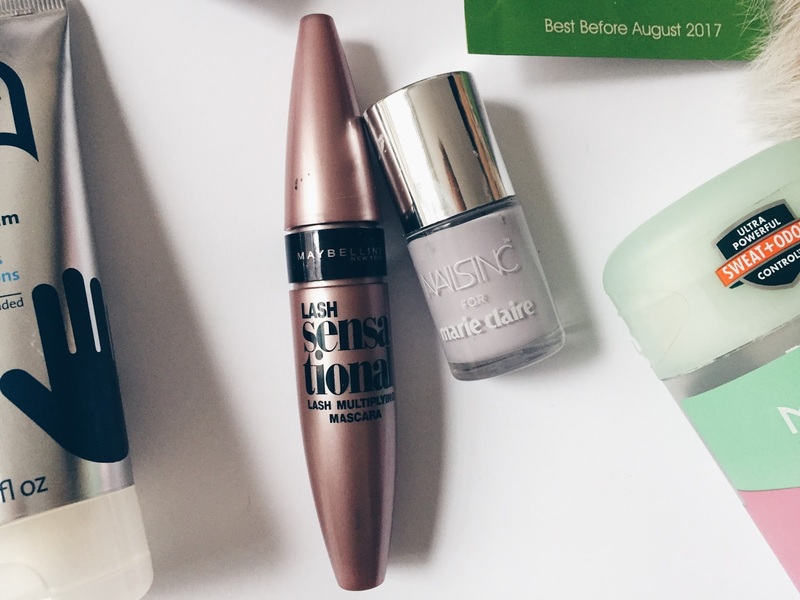 I liked using it before applying the mascara as it worked perfectly as a primer, adding length and a bit of volume to the lashes and protecting them from the mascara coats. Over 2 weeks of using, I noticed that my lashes were softer, hydrated and looked healthier. It can be used on both lashes and eyelashes and it works great as an overnight treatment! Available from IIAA Website, £16 for a full size. These capsules are a night treatment which energises the skin and increases free radical defence. The product is loved by many celebrities such as Poppy Delavigne and Emilia Fox. 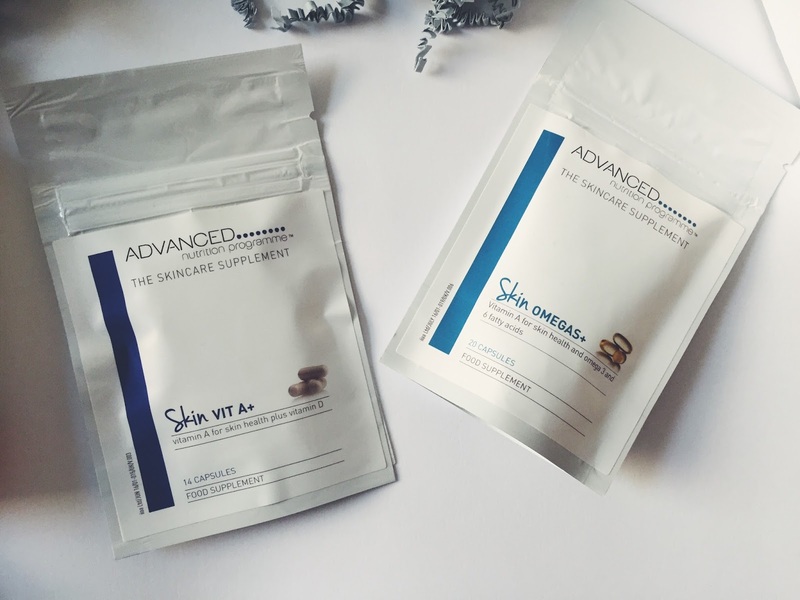 The capsules include ingredient such as vitamin A (Retinol), vitamin C (boosts collagen) which have antioxidant properties and normalise the skin. The Green Tea extract and vitamin E are powerful antioxidants which help to neutralise the damaging effect of free radicals. I was very excited to try these capsules as I am a fan of serums and skin capsules. Each capsule lasts for one application and should be applied on face and neck. It absorbed quickly and didn’t stain the bedsheets so you can go to sleep straightaway and let the capsules do their magic overnight. Overall, the capsules hydrated my skin and reduced the uneven skin tone which improved after every use. The skin felt smooth and the capsules were a great remedy when my skin was looking dull and tired. Available after consultation from IIAA Website, £44 for 30 capsules. Although this product is designed for a more mature age group, I wanted to see how it will react with my skin. It is formulated with 3 peptide complexes which keep your skin looking younger for longer. Peptides are an essential ingredient in anti-ageing products as they help to smooth down any lines and wrinkles and restore collagen levels. 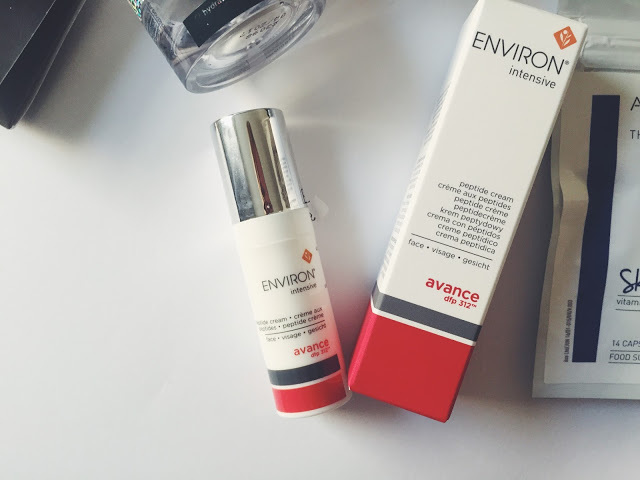 The Environ Avance is also filled with moisturising ingredients such as hyaluronic acids which restore the skin’s moisture. I used it as a night cream, and I felt that it really nourished my skin. Over the testing time, I also noticed that the skin around my lips and on my forehead look firmer even though I don’t have any strong fine lines yet. It is a great product for an older age group, and I would recommend it as a Christmas gift for your mother, aunt or an older friend. Available after consultation from the IIAA Website, £ 75 for 30ml. We all know that Vitamin A is an essential vitamin to having a healthy and glowing skin. It is essential for cell production and repair, and it helps to prevent collagen breakdown, maintaining skin’s firmness. It also promotes better moisture levels, and balances the oil in the skin. The supplement also contains Vitamin D which is quite difficult to get, especially if you live in the rainy London. Vitamin D is also a vital ingredient as it has anti-ageing properties, protects the skin from bacterial infections and promotes cell growth. After using it for two weeks my skin felt healthier, an I noticed a decrease in breakouts. It is definitely a skin supplement that helps to maintain healthy skin, especially in the winter months. Available from the IIAA Website , £19.95 for 60 capsules. The Skin Omegas contain omega 3 and 6, and is enriched with vitamin A, supporting skin health. Filled with fatty acids, fish oil, and evening primrose oil the supplement works to bring you a healthy and luminous complexion. They help to prevent moisture loss and play and essential role in formulation of cell walls. Since my skin is usually dry, I need the help of supplements to maintain high moisture levels and prevent moisture loss. I really liked this supplement as it made my skin radiant and hydrated, ready for make-up application. Available from the IIAA Website, £28 for 60 capsules. 3. Listen to Christmas songs! Welcome the November Libbie Club! It is filled with the perfect gift ideas ranging from skincare, bodycare and makeup. You can get all these products for a special price from My Libbie Club Website here. Enjoy! As you know, bodycare and beauty body treatments are one of my favourite beauty activities. For bodycare I find that rosemary and lemongrass scent is ideal, it awakens the senses and helps to relax especially after a long day at work. I often wear heels so I was really needing this foot treatment filled with softening and nourishing sweet almond oil, soothing rosemary oil as well as antibacterial and cleansing lemongrass. 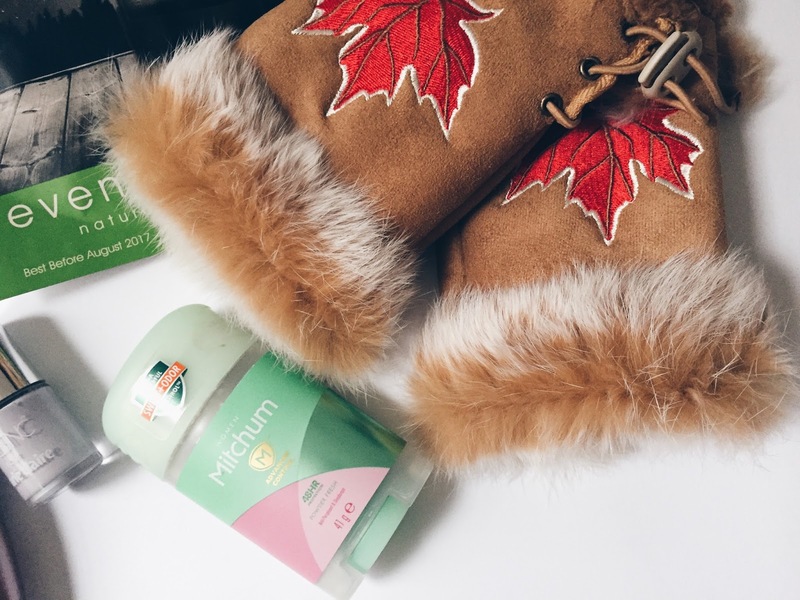 A winter must – have and a perfect Christmas Gift! Oh and I forgot to mention, the smell is really really DIVINE! This time of the year is ideal for lighting up candles and feeling cozy at home. The Merry Christmas Pure Soy Candle is hand poured and made in the English Countryside. The scent can be described as a mix of festive notes such as winter flowers and Christmas Greenery. 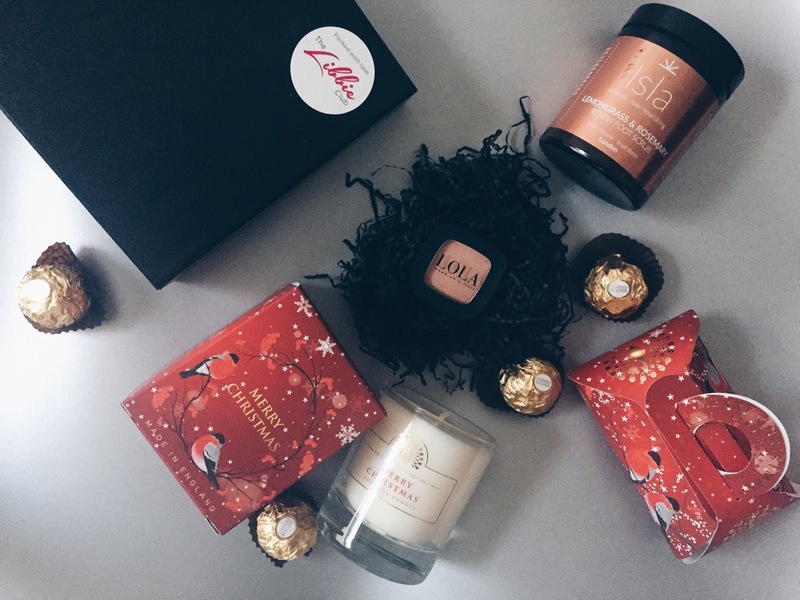 The candle is beautifully packaged in a red thick paper box, and comes in glass. The burning time is 35h. The bath soap has the matching scent to the candle. It is also wrapped in the lovely festive paper which makes those two a perfect gift. The soap is hydrating as it contains the rich Shea butter, mixed with the essential oils. Lovely, nourishing soap, leaving your skin smooth and smelling festive! I got the 017 Satin Eyeshadow in this month’s box. Lately I am obsessed with gold, satin and shimmery shadows as they just add a lot of ‘glamour’ to my make-up. 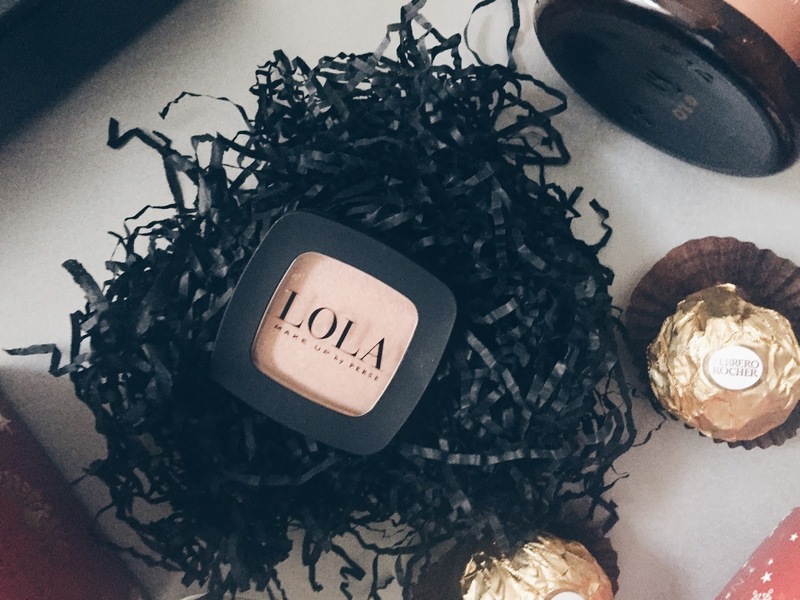 The shades from Lola are easy to apply, and can be applied with a brush or applicator. I am a fan of brushes which is why I always apply the shadows with brushes as they are easier to blend in, especially if you use a variety of shades together. This eyeshadow can be used wet or dry. Wet your brush or applicator before applying for a more intense effect. It can be used for daily as well as for evening events. I love it! I don’t know whether you have seen the forecasts but apparently this will be one of the coldest winters in the UK! I am already freezing, so I am dreading the upcoming months…. At least we get an excuse to wrap up in a warm blanket, make ourselves a nice cup of chai latte and spend an evening with a new season of our favourite series. We must remember that Xmas and NY are very close so spend this time wisely and learn how to apply Strip Lashes but also give your lashes and brows some loving with the amazing Conditioning Serum from Nouveau Lashes. I never tried a conditioning serum before, so I was very excited to try this. I decided to stop plucking and shaping my eyebrows and ‘rock’ the natural look. This serum is filled with multivitamins which condition and promote growth of the lashes and brows. First immediate benefit that I noticed was that it helped in styling the eyebrows and held them in place throughout the day. Second benefit was that the antioxidants protect it from the environmental pollutants and lastly it works as a perfect primer under mascara. I applied it to clean lashes and brows twice a day, and I started seeing the results after 5 days. The brows look healthier and the eyelashes felt thicker too. 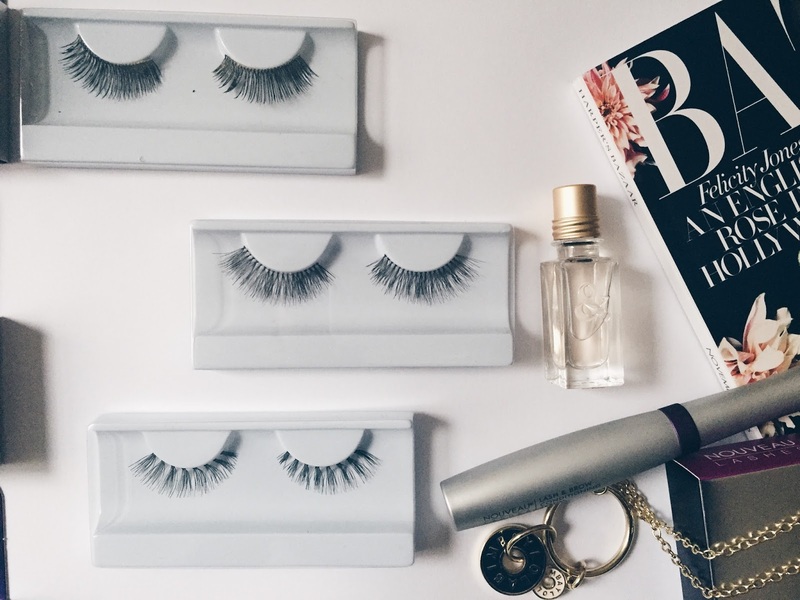 I will definitely continue using it daily, especially that I use mascara everyday and often apply the strip lashes so I want to keep my lashes in the perfect conditions! If you follow me on Instagram, you probably saw that I have been trying out some gorgeous lashes from Nouveau Lashes. I must admit at the beginning it was quite challenging to apply them but once you get to hang of it, it is super easy. 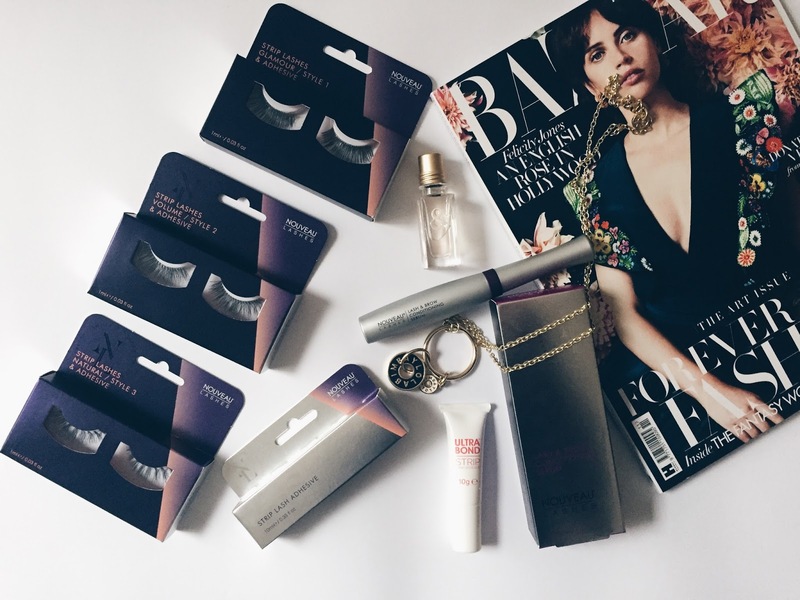 The lashes look stunning and are perfect for dinner, night out or drinks. I actually got a lot of compliments when I wore the Glamour Style 3 Lashes during halloween. Once you apply them they stay on the whole night, and you don’t need to retouch them at all. 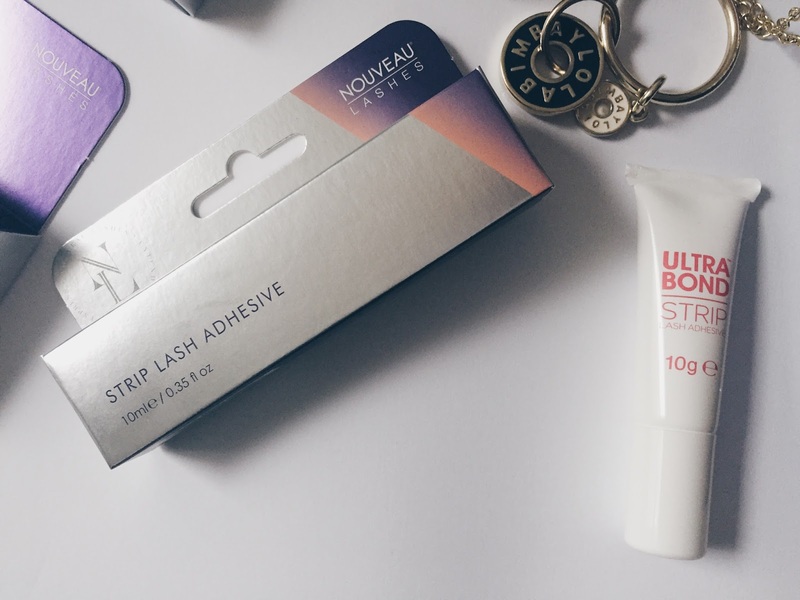 The adhesive is very good quality and even though I took it in my handbag, I didn’t feel the need to use it. Overall, I think the eyelashes are great quality, can be reused and are durable. I would definitely invest in Nouveau Lashes. Once again it is favourites time! I hope you have got your halloween outfit and makeup ready! I will be posting some Halloween posts and looks on my Instagram so make sure you stay updated! 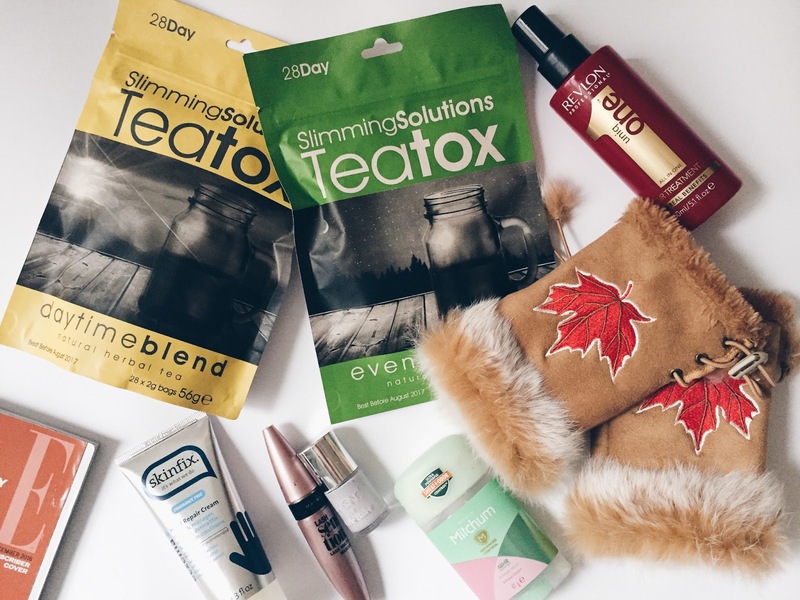 This month’s favourites are filled with skincare, bodycare and makeup as I had more time for pampering! There is nothing better during a cold Autumn morning than a hot shower with a coffee scrub. 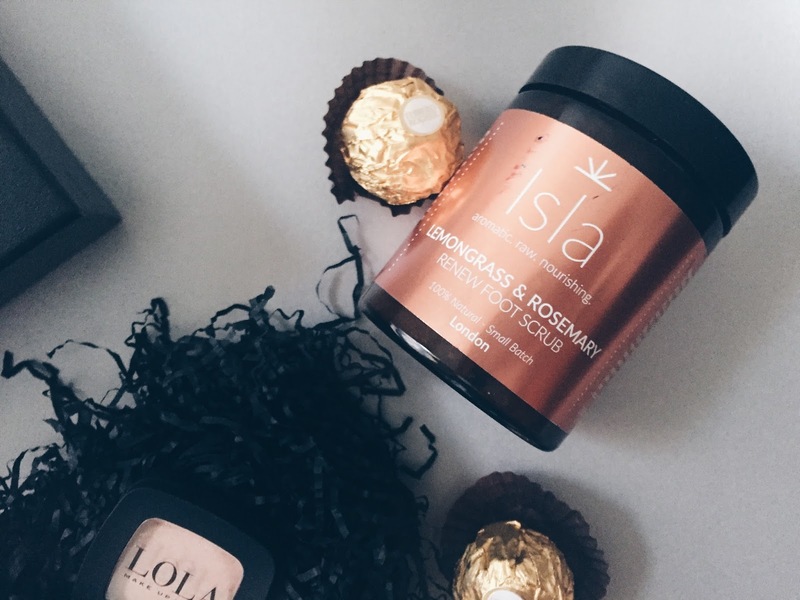 Coffee Scrub has great benefits for the skin such as anti-cellulite properties, reduction of scars and blemishes and it nourishes the skin. 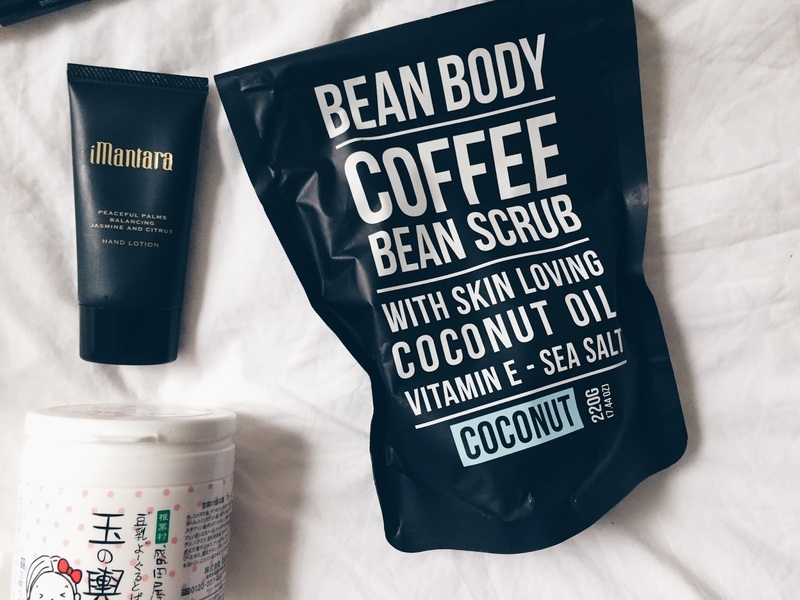 The Bean Body Coconut Coffee Scrub is made with organic Robusta Coffee Beans, Organic Cold Pressed Coconut Oil, Himalayan Pink Rock Salt, Demerara Sugar, Organic Cacao and Vitamin E oil. 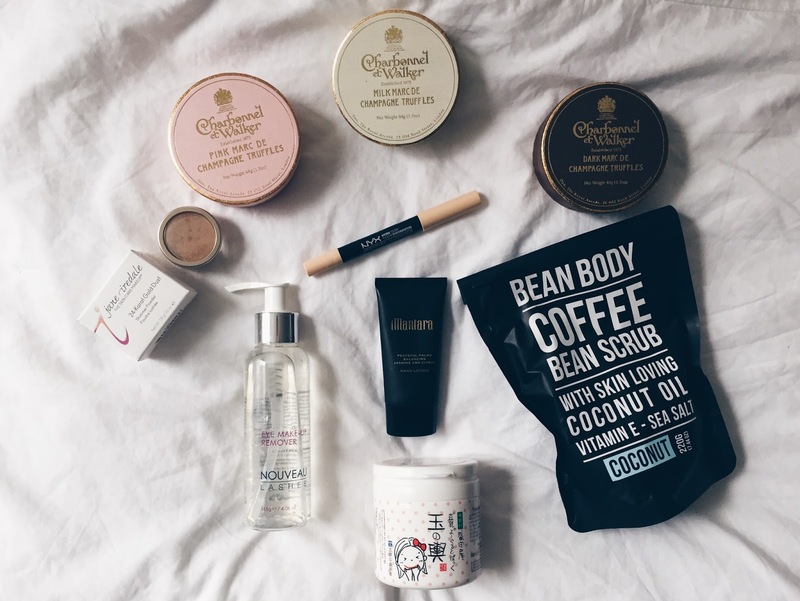 The coffee beans, the pink salt, sugar and Cacao are great exfoliants which effectively remove dead skin cells. The scrub is quite tough, which is exactly what you need to get rid of the unwanted skin layer. The cold pressed coconut oil combined with Vitamin E are ideal for nourishing the skin after exfoliation, leaving it silky smooth. Available from my Libbie Club, £14.95. You know that everything that has Neroli and Jasmine is right up my street so this hand lotion won me over straight away. The scent is a combination of Neroli water, Mandarin essential oil, Coconut, Jojoba and Sweet Almond oil and anti-ageing Honeysuckle extract. It is a non-greasy hand lotion, which sinks in quickly and leaves your hands feeling smooth and nourished. 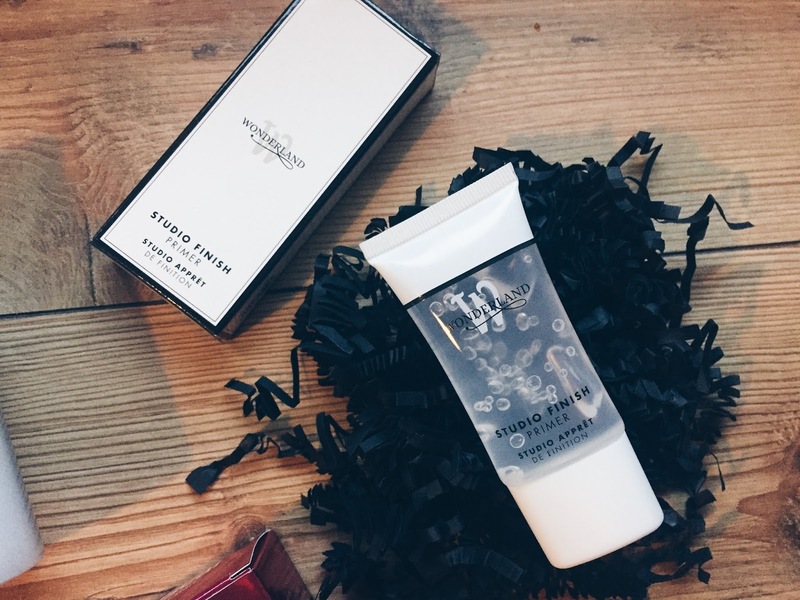 I find it hard to find a good hand cream, and this actually is one of my latests hand cream favourites as not only it does the job but also looks lovely and the smell is divine. 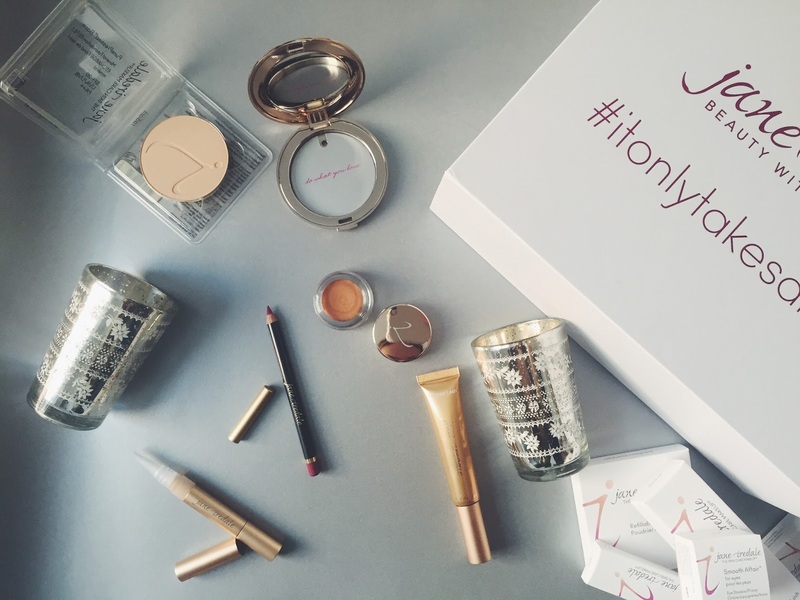 And let’s not forget the packaging – it looks stunning on my makeup table. I love it! Available here, £3.99. 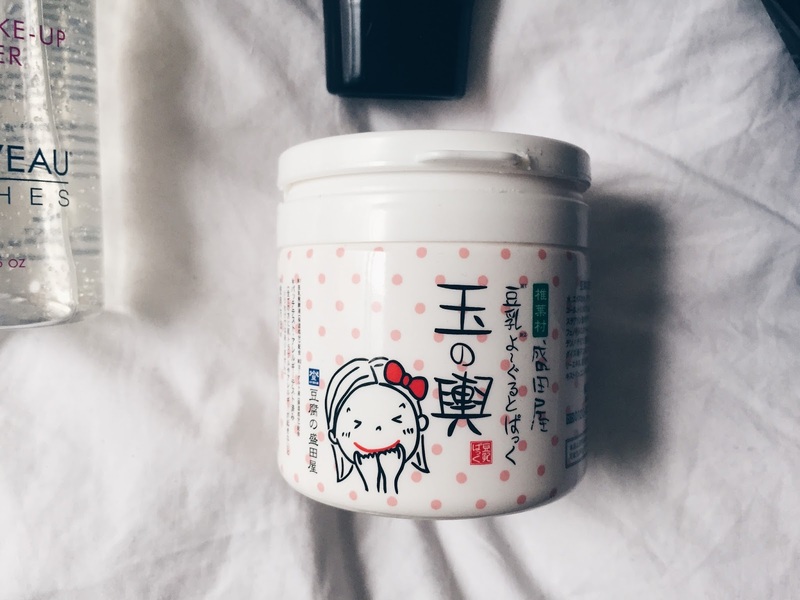 My flatmate from Beijing introduced this face mask to me recently and Wow, it is so great! The brand is from Japan, and this mask is a very popular drugstore mask amongst the Asian consumers. The main ingredients include soy milk, soya bean, yogurt and honey which are well known for their beneficial skincare properties. This mask is a rinse-off mask, so you apply it onto the cleansed skin, wait 5 minutes and then rinse it off with warm water. I loved my skin after each application as it is very hydrating and nourishing, leaving my skin plump and healthy looking. There is hardly any smell, and the consistency is like one of a face cream. It comes in this cute plastic box, and there is a lot of product so it will last you for a while. I am a fan! Available from Amazon, for £17.17. I recently received this lovely micellar gel Eye Make-Up Remover from Nouveau Lashes and I was amazed at how gently it removed the eye makeup. I usually struggle to remove eye makeup, and I feel that most products irritate the eye area, but this micellar gel is really gentle and efficient (no need for rubbing or rinsing off). I never used micellar gel so this is something new for me, but I will definitely repurchase this item as it leaves the eye area cleansed and hydrated as well, thanks to the prebiotic ingredients. It is suitable for both lash extensions and natural lashes. Available here, £14.99. Since NYX came to the UK I cannot stop using their products. This is my new favourite from this brand, the Hydra Touch Brightener in Glow Shade. It is designed to illuminate the face so should be applied to cheekbones, cupid bow and temples. It gives a shimmery finish when applied on the skin. I like this shade as it is a cool yellow but it warms up on the skin and makes the face brighter. It is water based and has a consistency of a soft crayon, it is easy to apply and blends in easily with foundation. A make-up junkie must-have. Available from Asos, £6.50. 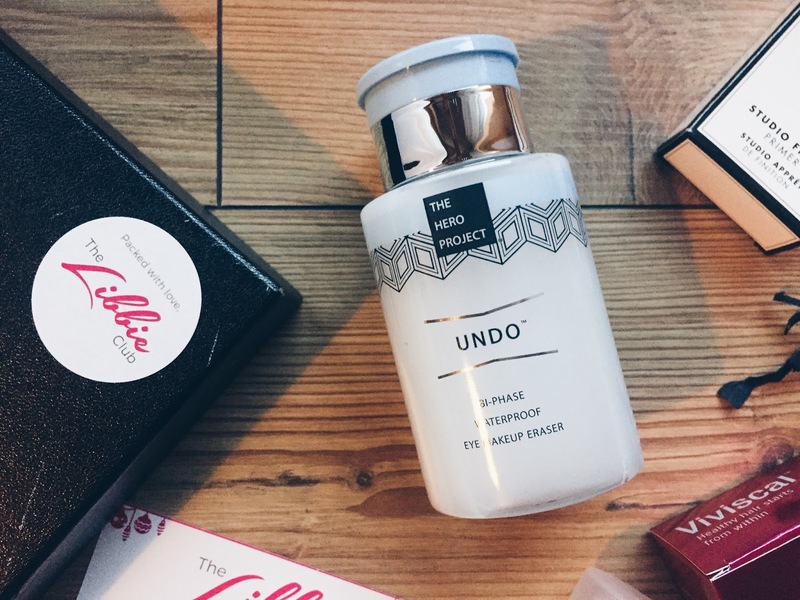 I recently discovered this brand during the Beauty Bloggers awards. Jane Iredale makes mineral makeup products which not only look good on the skin, but are also great for the skin. All products are multipurpose so you are free to experiment with how you use them. I was really excited to try the 24-Karat Gold Dust as I love wearing gold as an eyeshadow or as a highlighter. I found that this product looked great as an eyeshadow as it brightened my eye area and added a touch of glamour to my makeup. It comes in a loose powder, so you need to use the pot to sprinkle some inside, and a brush to apply. Overall it was long-lasting, looked very glamorous, and could be layered for a more evening look. Available from Jane Iredale, £15. 2. Send me your selfies!